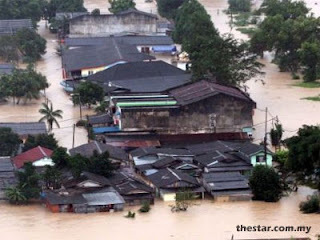 Actually I'm not collecting any funds for those flood victims, but to promote the charity event organize by Hitz.fm. This Charity Event will be held at Bangsar Shopping Centre, La Bodega, at 27th January(Saturday), from 11am till 2pm. Free refreshments will be provided for those who drop by. My mum have been always urge me to clean out some clean t shirt, and stationaries which I'm no longer in use anymore to be donate to those victims...Especially small kids, they need alot of things before they can resume their studies... I couldn't find any of those event which state out when and where until I saw Kenny post about the charity event... Thanks Kenny! Hopefully government of Malaysia will efficiently clear out the mess to prevent more and more troubles to come such as diseases... And whoever saw this post, please think of your stuff, stuff which you seldom use, donate to those flood victims... Maybe those stuffs to you are useless, but to them it can be something meaningful! Hooray, Its Rainbow Girl to the rescue. I am very proud that you would do such a nice thing. I would donate my stuff, but i am in New York, no matter my girl and I help others here. People new to us who do not speak to much english and have little or no money. It is good to help.